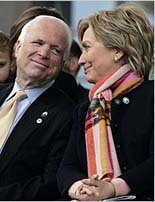 Opining that “rock star” Hillary Clinton did a “fine job” as secretary of state, Arizona’s disgrace John McCain says it would be a “tough choice” between supporting the liberal snake oil saleswoman who orchestrated the shameful Benghazi deception and conservative U.S. Sen. Rand Paul in 2016. That statement should rankle every party stalwart who expects those who run as Republicans to act as Republicans as well as support the GOP Platform. A failed presidential candidate, McCain is now taking orders from Obama, his former rival, as he joins sycophant Lindsey Graham traveling to Egypt at Obama’s instruction to urge the military, “hopefully including the Muslim Brotherhood,” to move ahead on new elections. This entry was posted on Thursday, August 1st, 2013 at 10:19 am and is filed under Duplicity, Elections, Global politics, Hope and Change, McStench, Outrage, Presidential campaigns, Those Dems. You can follow any responses to this entry through the RSS 2.0 feed. Both comments and pings are currently closed. What I want to know is why there is no attempt to censure this demented disgrace, John McCain? Where are the district chairs who censured the traitorous RINOs who supported the OBrewercare Medicaid expansion and even the Gov. Brewer herself? It’s clear the party apparatus will keep taking the crap this old liberal flings at us. I’m beyond disgusted at the lack of spine being displayed. Such surrender only emboldens McCain to throw more of the same in our direction. My question to the AZ GOP is what exactly do we get from this cretin that makes deferential silence the answer to repeated assaults on Republicans? Is he a high donor to the party and buying submission? If not, what has he done to earn an iota of respect or such abject passivity? If an Arizona Democrat did the same, loud voices would be raised or press releases sent out condemning such actions. I just saw one taking Democrat operative Carolyn Warner to task. This internecine treachery should rank as a much higher priority. Excellent assessment of the sad situation. My thoughts mirror yours so there is complete agreement. I suspect we are not alone. I hope some conservative district chairmen are reading this, or conservative Maricopa County Chair, AJ LaFaro sees the suggestion. How much are we expected to take from this decrepit liberal? We should not fear speaking out against the intolerable. Please see my comment below, Villanova. Villanova…I couldn’t have said it better myself. I moved from Texas to Arizona in 1991. I have voted against McCain in primary elections but voted for him in the general elections as the lesser of two eviles. As a Precinct Committeeman I talk to a lot of people about different issues and candidates. I understand more all the time why so many people tell me there is no difference in the two parties and to vote isn’t worth the trouble. My message to Senator McCain please be honest if you can, admit you’re a Democrat and change parties please. While you are at it take Jeff Flake with you. it would be nice if everywhere McCain and flake went if they were confronted by conservatives protesting their progressive demoncrat agendas. this one would be great to demonstrate at since rnc tool eric cantor will be there, he needs a wake up call and is one of the architects of the house comprehensive continuous open borders amnesty legislation. It’s official: Eric Cantor is a pimp. He’s pimping my religion to push immigration amnesty and the further destruction of America. Cantor is yet another RINO-JINO (Republican In Name Only-Jew In Name Only) who needs to drink a nice tall glass of STFU juice. They had NOTHING–NOTHING!–in common with the illegal aliens of today seeking a free golden ticket and already on a free ride. once they were here–did not go on public assistance, demand bilingual education, ask America to pay for them to give birth to and then feed their kids. They didn’t ask for free healthcare and portable phones on everyone else’s dime, either. Nope. My family members, who spoke no English, had no money, and came here with nothing, went to work. They taught themselves to read and write and they attained skills and created businesses. They became productive and educated Americans, all legally and all without taking a dime from Uncle Sam. As a Jewish family man, I was furious when I read about Cantor’s comments. My family’s history is much as Debbie Schlussel describes her own. It is a story repeated within the American Jewish experience. Eastern European Jews came to this country in the early 1900s. They all arrived via the LEGAL route, through Ellis Island. They were put on the next ship back (in steerage as they arrived) if they so much as coughed when they disembarked. Working menial jobs and learning English, they joyfully became Americans. Having been denied education in the ghettos in which they were forced to live, they put a premium on it when they arrived. That’s why itinerant peddlers had children who grew up to be doctors and lawyers. Comparing the illegals who have broken our laws,sapped our benefits and marched by the hundreds of thousands through our streets making demands while waving Mexican flags to Jewish immigrants is an outrage! Cantor should be ashamed of his statements. I doubt he is, but I am ashamed for him. As a conservative, I am also ashamed that AZ Congressman David Schweikert is hosting Cantor this Sunday (August 4) morning 8:00 am at an overpriced breakfast at the Chaparral Suites Conference Center, 5001 N. Scottsdale Road, Scottsdale. This signals to me that Schweikert is onboard with amnesty. He’ll configure it using all of the talking points Congressional Republicans are being fed to placate their district voters, but I will not be placated. We are being sold a bill of goods that will erode our children’s futures and there is no congressman worth that to me. Things like this are less surprising all the time. Why should McCain care? He keeps getting reelected, the lobbyists keep sending him his bribe money, he has filled the azgop with sycophants and his wife pretty much runs the chamber of commerce. It’s really no different than brewer expanding obamacare, republican refusal to defund obamacare or the forcing of the much hated amnesty upon us. All are bad for the country, all are unaffordable and all are being done at the direction of lobbyist and special interest. chambers of commerce etc… Demanding house members act completely in opposite of what those who elected them to office want, and instead impose amnesty upon the country. This is blackmail with the not so veiled threat of withholding bribe money from their political coffers and future payola. illegal aliens and legal immigrants are destroying the wage base of the middle and lower class. its all about supply and demand. virtually ALL of the increased unemployment/welfare numbers since match up to the numbers of illegal aliens and legal immigrants coming into the country since the late 90′s displacing American workers, driving down wages, and quality of life while increasing poverty among American Citizens. and the dirty politicians DO NOT CARE. they only care about the bribes and backroom deals with the lobbyist and special interest groups. They grow bolder all the time and the example of Johnny amnesty McCain is part of what emboldens them, he has screwed us at every opportunity and suffered no consequences. Amnesty will permanently destroy the middle class making us nothing more than a wage slave/welfare state with one party democrat control. The politicians know this and do not care, they worship at the feet of monied interest and their bribes even as they are damning us and the country. Watch the votes on amnesty and defunding obamacare just as it was on obrewercare and you will see our elected officials blatantly demonstrating that the offered bribes are more important than us peon voters. The fact is, pcrcPC, that voters are now irrelevant BECAUSE the elections process is completely corrupt. There has been extensive documentation of all sorts of voting fraud and rigged elections. Illegal aliens are voting and the Obama DOJ has actively taken measures to prevent that from being remedied. Voters no longer determine the outcomes of elections, “The Establishment” does. It’s in the bag! Villanova: A little background history for you. Stuff like this has been going on for a long time. McCain is SO petty and vindictive that, while a sitting U. S. Senator, he was going to run as a committeeman to unseat a committeeman who had promoted censure! So there have been censure votes against McCain. Nothing short of McCain’s death or his retirement is going to rid us of McCain. He has the financial backing of the Rothschild family and with that kind of money and global power you can buy anything, including elections! Hillary is one of many responsible for the deaths of 4 Americans and the cover up in Benghazi – of course McCain will support her it’s part of his dna. I find it appalling that a man who was a POW and who has two sons in the military would stand firmly with the woman who was responsible for the atrocities in Benghazi and orchestrated the cover-up with Barack Obama, Susan Rice and Jay Carney. The administration officials even told those who were going to aid the men at the embassy to “stand down.” In other words, John McCain’s choice for president of the United States in 2016 was ultimately responsible for the loss of four American lives at a US embassy…one of whom was the US Ambassador! John McCain is more than an embarrassment. He’s dangerous. I agree that something should be done to reign him in. But don’t hold your breath waiting for the state party to do or say anything. They are run by his and Flake’s operatives. Down here in Tucson, we’ve got Jim Click and Mike Hellon raising mega bucks for him and doing his bidding. I’m seriously considering changing my registration to Independent. I see nothing that is conservative coming from the state party. I don’t understand why it always has to be a party issue. George Bush signed the patriot act, and liberals screamed. Now Obama is collecting all of our emails and phone records and liberals are sheepishly making apologies for him. The superficial and rhetorical differences between Obama and Bush may be extreme, but the substantial differences are few. If Rand Paul will promise to end the illegal spying and contravention of the 4th amendment (and if I believe him) I’ll vote for him. If not I’ll vote for a 3rd party or not at all. No one is forcing us to vote for one of the typically bad 2 major candidates. I understand there is a recall effort against McCain and Flake. What’s the status of the recall, or are the people of yanking my chain? I doubt such an effort exists. I’m a precinct committeeman and haven’t heard of a recall of these deceivers taking place.The conservative base is busy trying to collect signatures to place Brewer’s Medicaid expansion on the ballot. There’s only so much that can be done and working issues simultaneously results in nothing going forward. This is a huge undertaking complicated by Phoenix summer temperatures. I thought it was not about party loyalty and bi partisan politics but what is best for the U.S. at this point neither party is doing anything but supporting the rich and the businesses and all that is going on is that it is harder and harder to find jobs in this country. If that treasonous McCain had been court-martialed 40 years ago instead of being made into a “hero,” the U.S. might have taken a turn for the better. As long as trash like him and Hillary are allowed to become the “elite,” we are doomed to continue our descent into hell. McPain: Please jump off of a high building as soon as possible. By your continued existence, you’re using up precious oxygen better utilized by more valuable creatures such as tree slugs. Thank you. Once again, John McCain shows contempt for the Republican Party that foolishly keeps putting him in his plush DC office and giving him prestige he has never deserved. I haven’t voted for him in years and despise all he stands for. He corrupts those he takes under wing as he attempts to ensure his radical leftist bent continues after he’s gone …which can‘t be soon enough. I stopped contributing to Arizona Right to Life because of their bonding to this phoney. I will no longer contribute to the AZ GOP until they call him out, which from what I’ve observed is likely to be never. We’ll use those funds to directly help conservative candidates. I have not given to organizational groups like the azgop in over a decade, I save my donations for people who actually support the platform. This election cycle so far there is only one candidate I am sure I will donate to and that is Steve smith running for az ld 11 senate seat. I would much rather my donations stayed here, but I have little confidence in the candidates straying from the platform, principles and ideology of the Republican Party. They are going to have to prove and proclaim conservative values (and that includes their staffs and campaign co chairs)to get a dime or a vote from me. Never again the lesser of two evils. This RINO is sickening. Can’t Arizonans recall or get rid of this fool? Arizona went from Goldwater Republicans to Chris Christie Republicrats. This is sad stuff. McCain has no allegiance to anyone or anything. He is a typical bureaucrat military man out for his own interests. And his wife is wealthy enough to put him above party loyalty. Calling him a snake is an insult to reptiles.